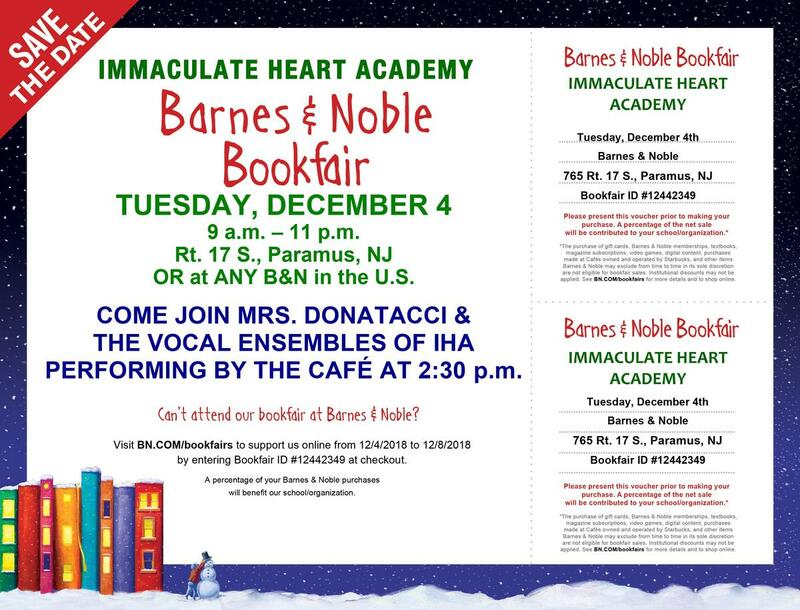 IHA's Winter Barnes & Noble Bookfair is planned for Dec. 4 from 9 a.m. to 11 p.m.
Stop by any Barnes & Noble on Tuesday, Dec. 4 to shop in person and present the attached vouchers at checkout. 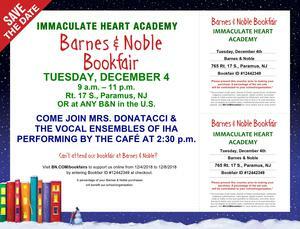 OR shop online from Dec. 4 through Dec. 8 at BN.com/bookfairs; enter Bookfair ID #12442349 at checkout and a percentage of your purchase will benefit IHA. Come join Mrs. Donatacci and the IHA vocal ensembles on Dec. 4 at 2:30 p.m. at the Rt. 17 S. Paramus Barnes & Noble!